Both my wife and I had been after a laptop for ages and having helped a friend pick out a new laptop, she insisted on paying me for my time. I refused, but said I’d take her old laptop as payment. She and her husband thought I was mad, since they were going to bin it. The Wi-Fi had died, the DVD drive had also given up the ghost and it had an AZERTY keyboard – well it would, it’s French. Phase 1 would be rejuvenating the old notebook. The laptop ran Vista – slowly. My plan was to install an English version of Windows 7 on it and tell the OS it had an English keyboard. Wi-fi would be provided by a USB dongle and the keys were (ahem) “altered” by the simple expedient of sticky labels. Thus I began rejuvenating the old notebook. The Windows 7 disc was ordered on-line and while I waited for delivery, I continued to use the French notebook. While doing so, I made a rather startling discovery. Linux would run on an old XP machine and even make it usable on-line. I had been sent up to the top room one day because in my wife’s words, “There is some computer stuff you need to sort out…” I’d completely forgotten about that. Well, imagine my surprise when I found not one XP machine, but three! An idea formed to test out the claim about Linux. 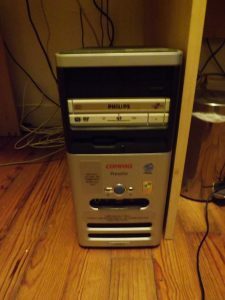 So, I examined all the machines, picked the fastest and by removing the best bits from the others, cobbled together a hybrid job of a Compaq S5160UK with an Intel Celleron 2.7 GHz 32 bit processor. I managed to get .75Gb of RAM together and even a Philips Lightscribe DVD writer, so I was ready to go. I fired it up and, lo and behold it worked! x86 processor (Linux Mint 64-bit requires a 64-bit processor). 512 MB RAM (1GB recommended for comfortable usage I was over the minimum – phew! ).